The 2018 Harvest Moon - shot from the front yard with an iPhone XS. The setup was an 6” telescope shooting through a 32mm eyepiece and f/6.3 Focal Reducer. Since the eye relief on this eyepiece is pretty poor, I used a universal phone/webcam mount to hold the phone steady at the eyepiece. 1/2 bottle of wine was also useful. Open the wine. Drink some. Align the telescope to the moon and look at it with another eyepiece. It is a pretty awesome rock. But use protection. You are looking at an indirect yet magnified reflection of the sun when you look at the moon. Use a moon filter when directly observing to protect your eyeballs. Moon filter is not necessary for photography but can bring in more details and can prolong your imaging sensor. Long exposures against any reflection this bright, can burn in pixels on most sensors. Adjust the position to center the moon in the shot. The moon is moving but relatively slowly, you shouldn’t have to worry about active tracking or equatorial alignment. It will take it about 1-2 minutes to creep out of your frame. Plenty of time to point and shoot, adjust, repeat. Looking through the phone, focus through the eyepiece on the phone camera and adjust the telescope focus manually. 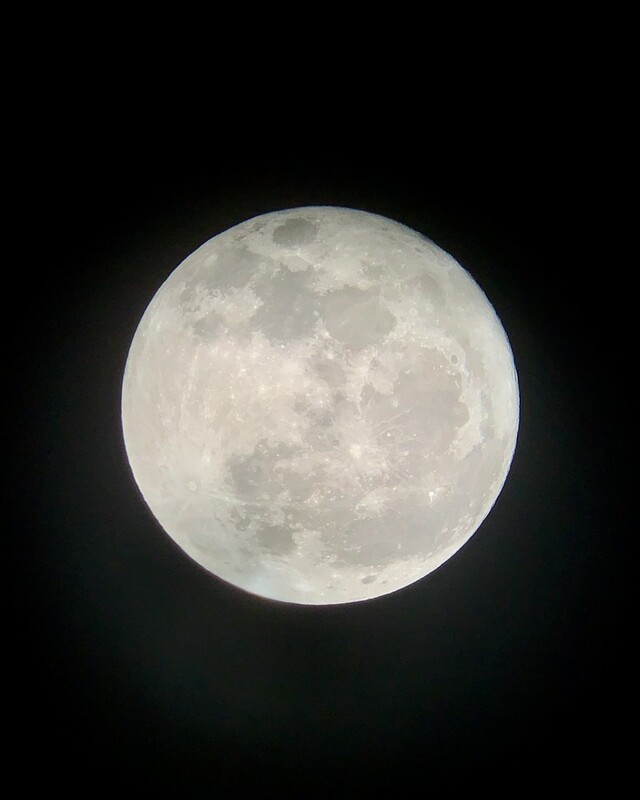 Use the phone zoom features (if equipped) to manually focus the image through the telescope. AutoFocus on the phone, Manual Focus on the Telescope. No flash. ..and ponder on the awesome science-y things that the moon does for us. it influences the 24 hour day, influences (but not completely) our tides, stabilizes our weather patterns… gives werewolves something to do… You know, science. okay, maybe that’s enough wine. put the telescope up and go to bed.